NHC Photo of Tropical Storm Kirk at 11AM on Thursday. 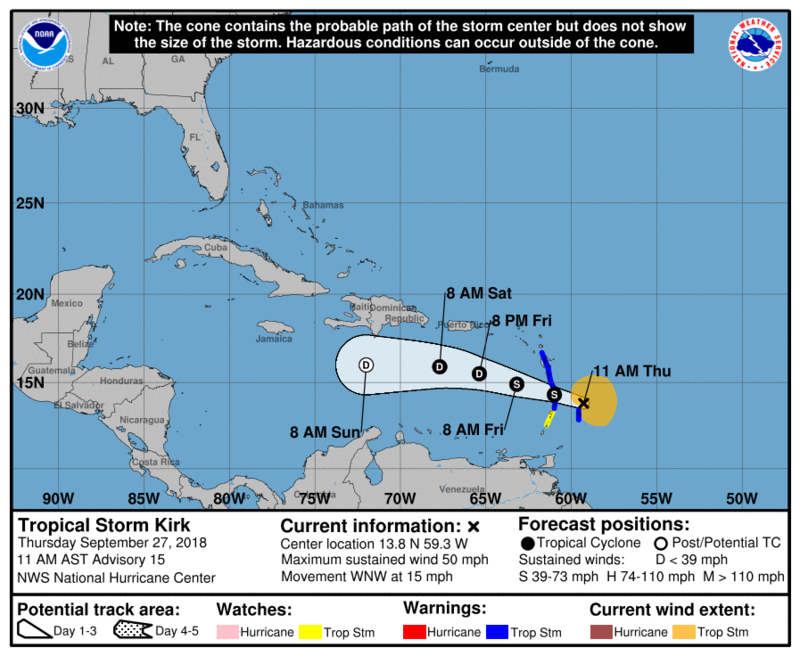 The Disaster Management Coordination Agency (DMCA) is monitoring the progress of Tropical Storm Kirk, which is expected to pass well to the south of the island, between St. Lucia and Martinique. However, according to the Antigua Meteorological Services, Montserrat will experience some moderate to heavy showers and gusty winds late Thursday into early Friday September 28th. The Antigua Met indicated that on Tropical Storm Kirk’s current track, its center and tropical storm force winds will pass at a safe enough distance to the south of the forecast area. However, spiral bands associated with the storm are likely to bring cloudy skies with moderate to heavy showers and gusty winds to the island late Thursday into early Friday September 29th. Total rainfall accumulation of 1 to 2 inches with a maximum of 4 inches in isolated amounts is possible. It stated that marine conditions will further deteriorate later on tonight into early Friday September 29th; hence, small craft warnings are in effect against hazardous sea conditions. Residents and visitors are advised to closely monitor the progress of Kirk until it exits the area and to take the necessary precautions depending on their vulnerability. Residents and visitors are also warned to stay away from coastal areas across Montserrat because of the potential effects of storm surges. Residents in Isles Bay Hill and other persons crossing the Belham Valley River are asked to take extra precautions during heavy rainfall associated with Tropical Storm Kirk, due, to the possibility of lahars occurring with little or no warning in the area. A Tropical Storm Warning continues for Barbados, St. Lucia, Dominica, Martinique and Guadeloupe. Tropical storm conditions are expected to first reach the warning area this afternoon, making outside preparations difficult or dangerous. A Tropical Storm Watch continues for St. Vincent and the Grenadines. Tropical storm conditions are possible within the watch area by this afternoon. Tropical Storm Kirk is centered as of 11 a.m. AST about 45 miles (70 km) north-northeast of Barbados and about 130 miles (210 km) east-southeast of Martinique. The storm is moving toward the west-northwest near 15 mph (24 km/h), and this general motion with a slight decrease in forward speed is expected over the next few days. On the forecast track, the center of Kirk will move across the Lesser Antilles within the Tropical Storm Warning area by this evening. Maximum sustained winds are near 50 mph (85 km/h) with higher gusts. Gradual weakening is anticipated during the next couple of days, but Kirk is forecast to move across the Lesser Antilles and into the eastern Caribbean Sea as a tropical storm. Kirk is expected to produce total rainfall of 4 to 6 inches across the northern Windward and southern Leeward Islands with isolated maximum totals up to 10 inches across Martinique and Dominica. These rains may produce life-threatening flash floods and mudslides. Across eastern Puerto Rico, Kirk is expected to bring 2 to 4 inches with isolated maximum totals of 6 inches by Friday and Saturday.